The waters of the BVI are well protected, easy to navigate and the 60 islands and cays present a fantastic scenery with an amazing selection of beautiful beaches, well protected anchorages and cozy bars and restaurants. Enjoy your Caribbean experience. We have the professionalism and knowledge to match you with the ultimate boat and thus ensure you of a sailing adventure you will always remember. We know all the local bareboat companies and have selected the best, which are not necessarily the most expensive. Do you want a sail boat or a power yacht? Do you want a monohull or a catamaran? The choice is yours! Let us help you find the boat that suits your needs. You can use your boat as a base from which to explore an endless array of water sports: body boarding, surfing, diving, kite boarding, wind surfing, you name it, we have it and you can rent the equipment here. Would you like to join a local regatta? Let us arrange it for you. They are mostly “fun regattas” where you will be penalized for NOT enjoying yourself. Come join the fun – at one of our informal yacht club races. If you are into more serious racing, come join us at one of the best sailing events in the Caribbean – the BVI Spring Regatta. Please note that dates are approximate. In January and November there are often a 10% discount and in low season most companies offer 10 days for the price of 7!! If you want to learn more about this amazing place and do a bit of planning in advance, I can highly recommend getting a copy of the Cruising Guide to the Virgin Islands. If you are arriving late afternoon, we can often arrange a “sleep aboard” for about 50% of the daily fee. This option is only available the night before the charter and has to be arranged in advance. Boarding time is usually after 5 pm. We will also be happy to arrange a taxi to pick you up and bring you to the boat. If you are not too sure about your sailing capabilities, we will be happy to help you arrange for a captain, but remember that he needs a cabin too if he is staying over-night. Prices are from $ 175/day + meals. 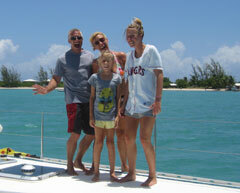 Some captains are also sailing instructors and can certify you at different levels at $ 175/day. Chefs are also available for $ 150/day and of course they need a cabin, too. COME ENJOY THE SUN AND SHARE THE FUN!!! !